This panting was part of a commission prepared as one of a pair for a gift to His Royal Highness the Prince of Wales. 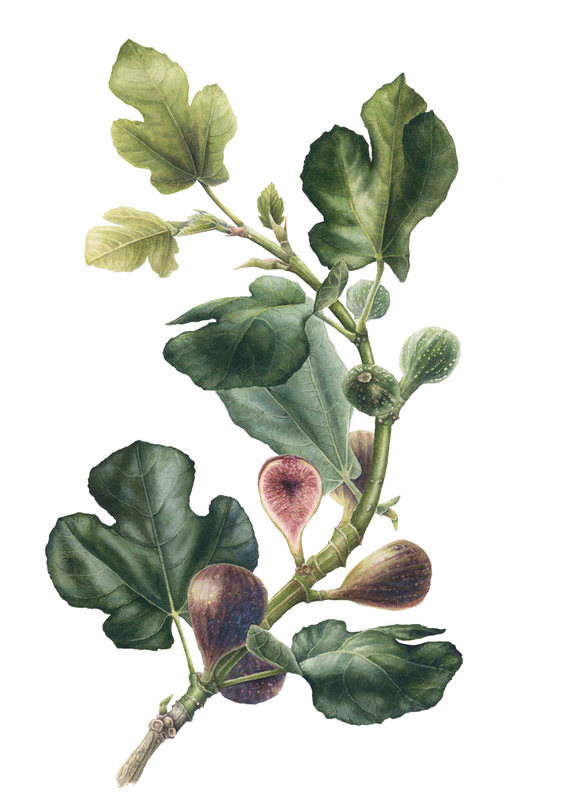 Fig, Ficus carica, is native to Syria and Persia, and has been grown in Britain since Roman times. Only a few varieties are hardy enough for outdoor cultivation on warm walls, where they survive most winters unscathed – very hard prolonged frosts may kill all the top growth, but plants revive from below ground. Ficus carica ‘Brown Turkey’ is a prolific and reliable variety. The Royal Horticultural Society has given it its prestigious Award of Garden Merit (AGM). Figs are very typical of the Middle East and are a joy to paint, with their gradations in colours, fruit and leaf size.